Astronomy is an ancient science, long separated from the study of terrestrial physics. In the Aristotelian worldview, bodies in the sky appeared to be unchanging spheres whose only motion was uniform motion in a circle, while the earthly world was the realm which underwent growth and decay and in which natural motion was in a straight line and ended when the moving object reached its goal. Consequently, it was held that the celestial region was made of a fundamentally different kind of matter from that found in the terrestrial sphere; either Fire as maintained by Plato, or Aether as maintained by Aristotle. During the 17th century, natural philosophers such as Galileo, Descartes, and Newton began to maintain that the celestial and terrestrial regions were made of similar kinds of material and were subject to the same natural laws. Their challenge was that the tools had not yet been invented with which to prove these assertions. 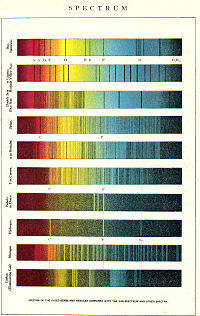 In 1885, Edward C. Pickering undertook an ambitious program of stellar spectral classification at Harvard College Observatory, in which a team of woman computers, notably Williamina Fleming, Antonia Maury, and Annie Jump Cannon, classified the spectra recorded on photographic plates. By 1890, a catalog of over 10,000 stars had been prepared that grouped them into thirteen spectral types. Following Pickering's vision, by 1924 Cannon expanded the catalog to nine volumes and over a quarter of a million stars, developing the Harvard Classification Scheme which was accepted for worldwide use in 1922. 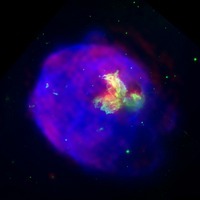 Supernova remnant LMC N 63A imaged in x-ray (blue), optical (green) and radio (red) wavelengths. The X-ray glow is from material heated to about ten million degrees Celsius by a shock wave generated by the supernova explosion. Radio astronomy studies radiation with a wavelength greater than a few millimeters. Example areas of study are radio waves, usually emitted by cold objects such as interstellar gas and dust clouds; the cosmic microwave background radiation which is the redshifted light from the Big Bang; pulsars, which were first detected at microwave frequencies. The study of these waves requires very large radio telescopes. Infrared astronomy studies radiation with a wavelength that is too long to be visible to the naked eye but is shorter than radio waves. Infrared observations are usually made with telescopes similar to the familiar optical telescopes. Objects colder than stars (such as planets) are normally studied at infrared frequencies. Optical astronomy is the oldest kind of astronomy. Telescopes paired with a charge-coupled device or spectroscopes are the most common instruments used. The Earth's atmosphere interferes somewhat with optical observations, so adaptive optics and space telescopes are used to obtain the highest possible image quality. In this wavelength range, stars are highly visible, and many chemical spectra can be observed to study the chemical composition of stars, galaxies and nebulae. Ultraviolet, X-ray and gamma ray astronomy study very energetic processes such as binary pulsars, black holes, magnetars, and many others. These kinds of radiation do not penetrate the Earth's atmosphere well. There are two methods in use to observe this part of the electromagnetic spectrum—space-based telescopes and ground-based imaging air Cherenkov telescopes (IACT). Examples of Observatories of the first type are RXTE, the Chandra X-ray Observatory and the Compton Gamma Ray Observatory. Examples of IACTs are the High Energy Stereoscopic System (H.E.S.S.) and the MAGIC telescope. Other than electromagnetic radiation, few things may be observed from the Earth that originate from great distances. A few gravitational wave observatories have been constructed, but gravitational waves are extremely difficult to detect. Neutrino observatories have also been built, primarily to study our Sun. Cosmic rays consisting of very high energy particles can be observed hitting the Earth's atmosphere. The topic of how stars change, or stellar evolution, is often modeled by placing the varieties of star types in their respective positions on the Hertzsprung–Russell diagram, which can be viewed as representing the state of a stellar object, from birth to destruction. ^ Keeler, James E. (November 1897), "The Importance of Astrophysical Research and the Relation of Astrophysics to the Other Physical Sciences", The Astrophysical Journal, 6 (4): 271–288, Bibcode:1897ApJ.....6..271K, doi:10.1086/140401, [Astrophysics] is closely allied on the one hand to astronomy, of which it may properly be classed as a branch, and on the other hand to chemistry and physics.… It seeks to ascertain the nature of the heavenly bodies, rather than their positions or motions in space–what they are, rather than where they are.… That which is perhaps most characteristic of astrophysics is the special prominence which it gives to the study of radiation. ^ "astrophysics". Merriam-Webster, Incorporated. Archived from the original on 10 June 2011. Retrieved 2011-05-22. ^ Lloyd, G.E.R. (1968). Aristotle: The Growth and Structure of His Thought. Cambridge: Cambridge University Press. pp. 134–135. ISBN 978-0-521-09456-6. ^ Cornford, Francis MacDonald (c. 1957) . Plato's Cosmology: The Timaeus of Plato translated, with a running commentary. Indianapolis: Bobbs Merrill Co. p. 118. ^ Edward Slowik (2013) . "Descartes' Physics". Stanford Encyclopedia of Philosophy. Retrieved 2015-07-18. ^ Ladislav Kvasz (2013). "Galileo, Descartes, and Newton – Founders of the Language of Physics" (PDF). Institute of Philosophy, Academy of Sciences of the Czech Republic. Retrieved 2015-07-18. ^ Case, Stephen (2015), "'Land-marks of the universe': John Herschel against the background of positional astronomy", Annals of Science, 72 (4): 417–434, Bibcode:2015AnSci..72..417C, doi:10.1080/00033790.2015.1034588, PMID 26221834, The great majority of astronomers working in the early nineteenth century were not interested in stars as physical objects. Far from being bodies with physical properties to be investigated, the stars were seen as markers measured in order to construct an accurate, detailed and precise background against which solar, lunar and planetary motions could be charted, primarily for terrestrial applications. ^ Hearnshaw, J.B. (1986). The analysis of starlight. Cambridge: Cambridge University Press. pp. 23–29. ISBN 978-0-521-39916-6. ^ Eddington, A.S. (1916). "On the radiative equilibrium of the stars". Monthly Notices of the Royal Astronomical Society. 77: 16–35. Bibcode:1916MNRAS..77...16E. doi:10.1093/mnras/77.1.16. ^ D. Mark Manley (2012). "Famous Astronomers and Astrophysicists". Kent State University. Retrieved 2015-07-17. ^ The science.ca team (2015). "Hubert Reeves – Astronomy, Astrophysics and Space Science". GCS Research Society. Retrieved 2015-07-17. ^ "Neil deGrasse Tyson". Hayden Planetarium. 2015. Retrieved 2015-07-17.